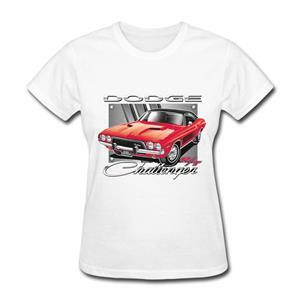 The "Dodge Challenger R/T" t-shirt features a large image of a red Challenger with chrome "Dodge Challenger" logos on the front. This is all printed on a high quality, pre-shrunk 100% cotton Gildan ladies t-shirt in white, and is fully licensed by Chrysler. PLEASE NOTE: This shirt may be special ordered in different colours. Please phone or email to enquire.